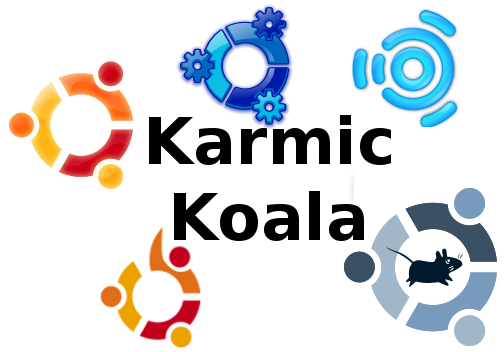 Getting Ready For Karmic Koala – Ubuntu, Kubuntu, Xubuntu …. Which one should you use? If you are looking for Karmic Koala to be used on a netbook, you are pretty much left with only Ubuntu Netbook Remix as the only option. Kubuntu Netbook uses the KDE's Plasma Netbook Shell which looks very promising but is, unfortunately, only a technical preview as of now. While you can still install Ubuntu or Xubuntu (or even Kubuntu) on a netbook you will not get a satisfactory performance as they have been designed for larger screen. For the rest of this discussion, we will not include the netbook releases. Minimum system requirements has never been a problem with any of the *buntus as they have very low requirements as compared to todays hardware. All of them will work with a 700 MHz Processor, 384 MB of RAM, 8 GB of hard drive space and a graphics card supporting VGA at 1024x728. However, enabling the visual effects in Ubuntu and Kubuntu will require atleat a 1.2 GHz Processor and a supported graphics card. Regarding the system resource used during a normal use, Xubuntu is the lightest, and will run just fine in a system with 256 MB RAM and VGA 800x600, while Kubuntu generally tends to take up the more resource. Ubuntu Studio is a difficult one to rank based on its system requirement as it is basically just Ubuntu geared toward multimedia editing. As a result, it takes up almost the same system resource as Ubuntu when it is not running any of the multimedia applications. However, it is meant for multimedia applications and when it is used for that, it requires the maximum resource of all. It also has the largest installer. Regarding the appearance, it all boils down to a comparision between GNOME, KDE and Xfce. Ubuntu, Edubuntu and Ubuntu Studio uses GNOME, Kubuntu uses KDE and Xubuntu uses XFCE. So if your main concern is appearance, Kubuntu with its KDE Plasma Shell will blow you away. It is simply one of the best looking desktop environments. Next comes the GNOME based systems - Ubuntu, Edubuntu and Ubuntu Studio, followed by Xubuntu. In terms of usability, both Ubuntu and Kubuntu are aimed towards the normal users who uses the system for general purposes. So, if you are a user looking for a OS for general use like web browsing, listening to music and various other applications, you are better off choosing either Ubuntu or Kubuntu. Edubuntu, on the other hand, is intended for educational use. Ubuntu Studio is meant for multimedia editing or creation. Xubuntu is meant to be a very light and fast. It is generally used in systems with low configurations. Again this boils down to a comparion of the applications available for KDE, GNOME and XFCE. Regarding the number of applications available, GNOME has the maximum number of applications available, followed by KDE and, then, XFCE. Moreover, GNOME applications tends to be more stable. However, if you don't mind some odd looking applications, with proper depedencies met, application from any of the desktop environment can run in any other environment. For example, you can have Amarok, a KDE application, running in Ubuntu, which is GNOME based. So, the applications available is not really a very important issue. There is no live version for Ubuntu Studio. Inspite of all these variants, Ubuntu, Kubuntu, Xubuntu, Edubuntu and Ubuntu Studio are basically the same thing underneath the desktop environment. As a result of this even if you choose to use any one of these, you can just install another over it and have both of them so that you can choose which one you want to use. For example, if you are using Ubuntu, you can just install kubuntu-desktop and have both Ubuntu and Kubuntu. So the great thing about this is that it does not really matter which *buntu you start off with; you can always install another and have two or maybe more of them.